Like many people, I’ve struggled with my weight and my self-confidence over the years. I’ve tried every single diet out there, I have spent money on pills, plans, memberships and inch loss wraps. If I’m being really honest, I’ve even tried liposuction. Finally, after years of misery, guilt, low energy, slimming pills and bingeing, I’ve found a good place emotionally and physically. More on that later. First, I wanted to articulate why I think so many people find dieting so confusing and how some of the advice can be dangerously damaging to people’s self confidence. I won’t say who said it, or when I heard this, but I heard an expert on the BBC a couple of weeks ago recommending that eating 800 calories or less per day was the best way to lose weight. It made me furious. Just to reiterate, the daily intake for a woman should be around 2,000 calories each day. As someone who has lurched from near self-starvation to more than 4,000 calories daily, I couldn’t believe my ears when I heard a “specialist” recommending such a course of action. What happens? On that intake you’re basically starving yourself. Your body’s natural instinct is to survive, so if you are not eating enough it will do everything in its power to make you eat. And when you do eat, it will feel the need to stock up in case you don’t eat again for a while. That’s also known as bingeing! Then your mind kicks in and questions why you’ve eaten all that food when you’re supposed to trying to lose weight. That’s called guilt! So you starve yourself again, eventually leading to a poorly-functioning metabolism which causes any excess calories to lead to weight gain. It’s a nightmare, and it’s not sustainable. We’re constantly bombarded with the latest fad diets. We see skinny Instagram models showing you how to be rake-thin in a fortnight. Open another window and buff men are there promoting protein shakes and fitness routines. Where do you turn? For me, there’s just one truth. That the only thing which really matters is a happy mind. A healthy body can help you get there, of course, but the way you look won’t make you happy on its own. So, emotional wellbeing balanced with a sensible diet is the foundation for my new-found self belief. To illustrate this, I would like to share my experience of extreme dieting versus healthy and mindful eating. About a decade ago I was very overweight – a result of post-pregnancy, comfort eating and lack of knowledge. I was desperately unhappy. The more I tried to lose weight, the bigger I seemed to become. I would spend ages scouring the internet trying to find ways to shed pounds. I lived on shakes, slimming pills and cigarettes. I was hungry, miserable and extremely lacking in energy. My body would crave food, sometimes the cravings were so intense that I would completely lose control and eat everything in sight. I was unable to stop. Panic and guilt would set in, and I would find ways to compensate for what I had just done. For years, I lived a repetitive and depressing cycle: guilt, followed by fear, then damaging restriction. I was completely consumed by it and I lost friends, my career suffered, my relationships broke down. I couldn’t understand what was wrong with me. Everyone else could go out for an anxiety-free dinner, leave food on their plates, avoid eating, not buy junk at the petrol station. Why couldn’t I? So what was a girl to do? I really had no clue. I’d spoken to some experts and knew some of the science but I had already caused so much damage physically and mentally that it was going to be hard to get out of the “diet” mentality. I had to learn how to eat again. I read books and studies, I watched documentaries, I even observed people eating (I know that sounds a bit creepy, don’t worry they didn’t know!). And I kept a diary and started listening to my body’s instincts. Eventually, I found a way of eating that worked for me. This is my list. Firstly, don’t let yourself become hungry. As I said above, your body’s instincts will kick in and you will find yourself eating more than you need to. Secondly, eat slowly – it’s easier to know when you are physically satisfied. In Japan, the Okinawan people follow a Confucian teaching called hara hachi bu. It means “belly 80 percent full” and it makes them the only human population to have a self-imposed habit of calorie restriction. It works because it takes time for stomach stretch signals to tell us we’re follow. Eat slowly, or stop early, and you won’t over eat. The result – the Okinawans have more people aged 100 or over (50 in every 100,000) than anywhere on the planet. Thirdly, and related to the above, savour every bite. You will feel more mentally satisfied if you have enjoyed your food. And finally, listen to your body’s signals. Try to get out of thinking that food is the answer to everything, like boredom, or sadness or emotional emptiness. Try replacing the urge to eat with something else, like reading a book, meditating or taking some exercise. It’s been a long old road but I finally feel like I’m in a place where I’m happy with the way I look, I’m calm about my approach food and, most importantly, I’m satisfied with my mentality. 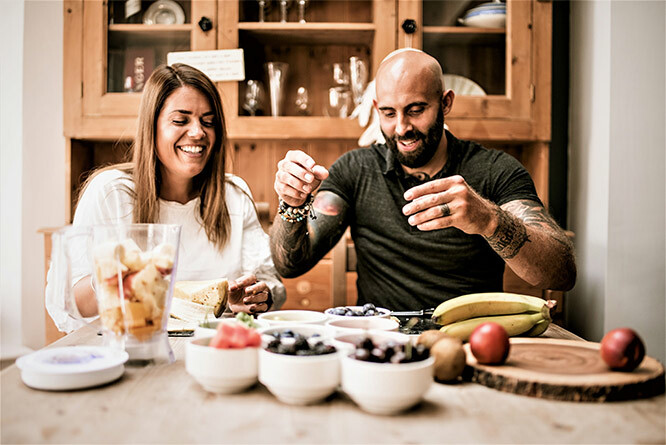 My husband Luke and I have set up a website and approach to diet and wellness called The 321 Effect. We want to help people find a balanced approach to a way of life where food isn’t an issue. In terms of eating, it’s based on three parts healthy food, two parts hearty and one part of “happy” food, like those ones which make you feel good such as puddings, treats and so on. But it’s not just about eating. We’ve also got loads of info on there about wellness and mindfulness – ideas to help you get that emotional balance in your life which will mean that obsession with diet becomes secondary to being content with who you are. For me, that’s the only thing that really matters. You can ‘look great’ but be miserable. Other people can say you’re ‘fat’ but you can be really happy with who you are. Like I said before, what you eat is bound to affect how you feel but, ultimately, it’s how you feel inside that counts. 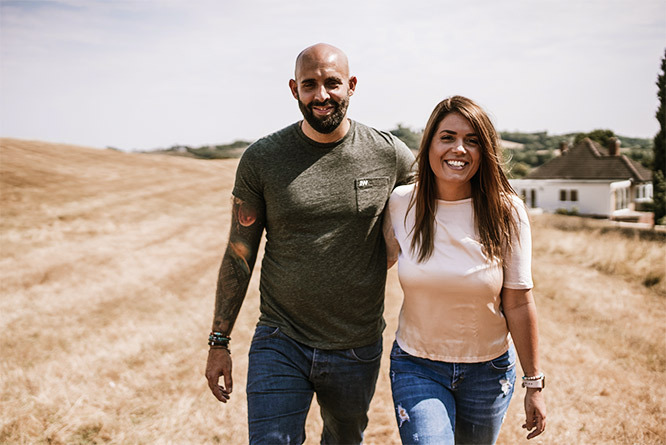 Francesca Hawker is the founder and owner of The 321 Effect, designed to inspire and support its members in the discovery of their own inner-self, to help remove the pressure from their relationship with food for good. Follow them on Twitter or Facebook.